The NEC DSX-40 is compact, wall-mountable, easy to install and intuitive to use. This phone system is ideal for small businesses. It comes with One DSX 40 Key Service Unit (4 x 8 x 2) (1090001), One 2 Port/8 Hour Intramail (1091060) and Three 34 Button Backlit Display Telephones in Black (1090021). 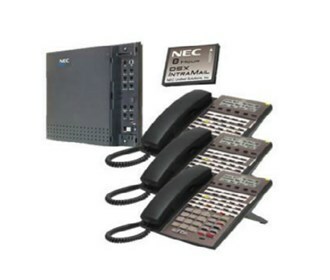 The NEC DSX Systems NEC-1091026M has many exciting features for users of all types. The NEC DSX Systems NEC-1091026M is sold as a Brand New Unopened Item.